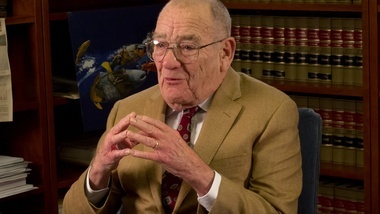 The recently retired judge who presided over the long-running salmon versus dams case in the Columbia Basin told a reporter the four lower Snake River dams should be breached. Speaking recently with Aaron Kunz, an Idaho Public Television and Boise State Public Radio reporter, former Judge James Redden said "I think we need to take those dams down." The judge has been a key figure in the more than 20-year-old regional effort to craft a plan that reconciles the operation of the federal hydro power system on the Snake and Columbia rivers with the needs of threatened and endangered salmon and steelhead. Three times Redden has tossed government plans which he said did too little to protect the fish that include Snake River sockeye, steelhead, fall chinook and spring chinook. In doing so, he sided with environmental groups, fishing interests and the Nez Perce Tribe who advocate breaching Ice Harbor, Lower Monumental, Little Goose and Lower Granite dams. The legal argument, however, has never focused directly on dam breaching. The Endangered Species Act requires the federal government to ensure its actions do not jeopardize the survival of protected plants, animals and fish. In 2000, 2004 and 2008, the National Marine Fisheries Service issued documents known as biological opinions, that have said plans to alter the way the U.S. Army Corps of Engineers dams are operated, combined with other actions like habitat improvement and hatchery and harvest reform would prevent the protected fish from being jeopardized. The Nez Perce Tribe, Oregon, fishing groups and environmentalists have challenged those findings and won. Redden did not have the power to remove the dams and instead directed the government to come up with a better plan. Only Congress, that authorized the dams, can direct and fund the U.S. Army Corps of Engineers to breach them. Redden did order the government to institute a regimen of spring and summer spill at the dams to help juvenile fish avoid passing through turbines during their journey to the ocean. Many observers credit that spill along with improved ocean conditions for increases in the return of both wild and hatchery fish during the past few years. For more than a decade, breaching advocates have carried on a campaign to convince political leaders and the general public that dam breaching is the only way to save the fish. On Wednesday, after Kunz published snippets of his interview with Redden, breaching supporters said his comments show there is a clear scientific and legal argument for dam removal. "He has taken a true independent look at it and said fish respond better when a river actually acts like a river," said Nicole Cordan, public policy director for the Save Our Wild Salmon campaign. "It was certainly exciting to hear him say that and it's always affirming to have somebody of his caliber having understood the scientific and legal side of all of this." At least one opponent said he was not surprised by Redden's support for dam removal and said he suspected the judge had environmental leanings. Attorney James Buchal who represents irrigators in the ongoing case and authored "The Great Salmon Hoax," previously tried to have Redden disqualified from the case for what he felt was a bias against the dams. "(It) has always been clear to me, he wants the dams out," said Buchal. "It's not a surprise." Buchal said it is not common for a retired judge to comment on an ongoing case. "It it is unusual, but people who are real hard-core environmentalists, it's like a religious thing, it is something that is deeply held and people are motivated to spread the gospel." Cordan rejected the idea Redden acted in a biased way and said the judge could have taken even stronger steps against the government but did not. "I think that is what makes this judge such an amazing judge. He might have had a particular view but he didn't let that view dictate on how he operated in court, he made decisions based on the law and that is his job." Redden stepped down from the case last November but not before ordering the government to come up with a new plan by 2013. Kunz interviewed him for an "Outdoor Idaho" episode on salmon recovery that will air in July. Snippets of his interview are available here.